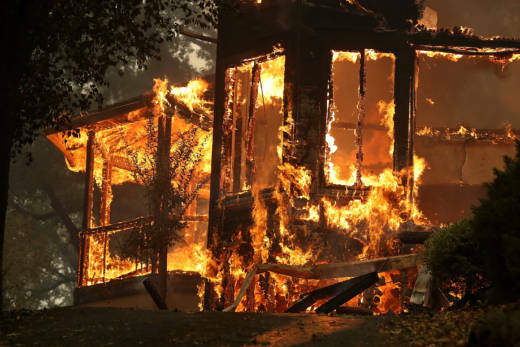 Insurers can calculate how likely your home is to burn down in a wildfire, or flood in a high tide, and for some time now they've been using climate science to shape those estimates. KQED Science Reporter Molly Peterson spoke with state Insurance Commissioner Dave Jones. He told her the growing risk of climate-related disasters is already hitting the insurance market. DAVE JONES: So one measure of this is the incidence of nonrenewals between 2015 and 2016 in these wildland urban interface counties. We've seen about a 15 percent increase in nonrenewals. Now, that doesn't mean that those 15 percent can't find any insurance. But the company they did have decided it was too risky to write insurance for them and decided not to renew them. MOLLY PETERSON: How can Californians know that the insurance industry is pricing the risk of climate change correctly? DJ: Fundamentally what they're rating on is their experience in historic losses. So the fires that occured in 2017 -- which caused some $12.3 billion in losses -- they're not allowed to take those $12.3 billion and shove them into next year's rate. But there is a catastrophic load in the rate development that allows them to, over time, get rate increases accordingly. So as climate change drives more catastrophic weather events, property and casualty insurers are thinking about these sorts of risks. For example, they're starting to use ever more sophisticated fire risk models. So they look at things like topography, slope, wind direction. It used to be that insurers had more generic approaches to try to figure out these risks. They would look at whole zip codes or whole counties or whole area codes. But now they're able to do it on a home-by-home basis. MP: If fires are getting bigger because of climate change, past experience only tells you so much about what that experience is going to be in the future. DJ: But the forward-looking science isn't fully developed enough to be able to rely on. There is a gap between the climate modeling versus the kind of modeling insurance companies need (in order) to decide what risk to write. And I think we are going to see rates go up. We're already getting rate filings that reflect the losses that the carriers experienced in 2017. The other thing that's occurring too -- areas that were thought to be lower risk like Santa Rosa are now understood to be at a higher risk. And so what that means is that the rate that they're entitled to get in certain areas is going to change, because those areas now demonstrably are at higher risk, too. MP: What do we know about how insurance companies use climate science? DJ: Where the big deficit has occurred is in insurance companies thinking about climate-related risk on the investment side of what they do. So, what's an example of this? Coal. Well, what's happened with regard to coal over the past couple of years? Some 35 coal companies went bankrupt. The Dow Jones stock indices for coal dropped some 92 percent in value. Major U.S. banks said they're no longer going to invest in coal infrastructure because it's not a good investment. I want insurance companies, as their regulator, to be invested in things that retain value, not things that drop in value. And I want them, at a minimum, to be thinking about this, and I concluded that they weren't. MP: We're talking about property owners around California who are vulnerable to a flood, vulnerable to fire, vulnerable to sea level rise in ways that weren't true in the past. Do you think the state should increase that burden on property owners to prepare for that vulnerability? DJ: There's no question that the state of California, like every other state, does a lousy job of making land-use decisions. One of the big disconnects that's resulting in more businesses and people living in harm's way is that decisions about whether to put new subdivisions or new homes, new businesses, into a floodplain or a high-risk fire area or on top of an earthquake fault, are made by local governments. And those local governments are not required, nor do they have any financial liability for, those decisions. Probably the biggest single improvement we could make is saying, look, we're going to require local governments to bear some of the cost of those decisions.